Rotary club of Colombo Fort, part of Rotary International District 3220, the world’s first service organisation appointed Rtn. 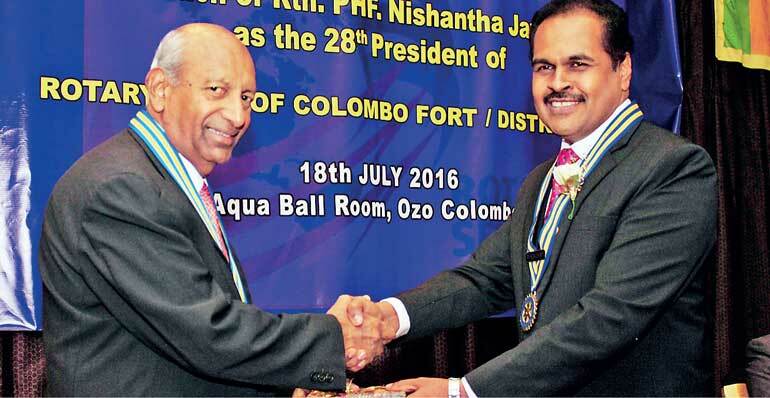 PHF Nishantha Jayamanne, of Hemas Hospitals – part of Hemas Holdings PLC, as the new President of the club at a glittering installation function held at Hotel Ozo Colombo recently. Gracing the occasion were Senaka Amarasingha, District Governor of Rotary District 3220 for Sri Lanka and Maldives as the chief guest and Dr. Duminda Samarasinghe, eminent Paediatric Cardiologist as the Guest of Honour. Dr. Lakith Peiris, Managing Director of Hemas Hospitals chain, was also present at the occasion. Nishantha took charge as the 28th President of the prestigious club which has pioneered many important community initiatives especially in the healthcare sector. Further the club elected a distinguished Board of Directors to ably support the President to achieve the club goals for the year 2016/17. “With many community initiative in the pipeline year 2016/17 will be a challenging one. I’m extremely fortunate to have a dedicated team along with me. Together I look forward to serve the community with great pride,” said Nishantha Jayamanne, the newly installed President. The club will be focussed on materialising its premier service project ‘Human Heart Valve Bank project’ together with Ministry of Healthcare and Nutrition, which would ensure the establishment of Sri Lanka’s first human heart valve bank at the Lady Ridgeway Hospital for Children in Colombo. This Rs. 30 million project will facilitate the hospital in saving many valuable lives of Sri Lankan children who are either born with congenital heart defects or have acquired heart diseases. It has been estimated that 2,500 to3,000 children are born with congenital heart defects in Sri Lanka annually.